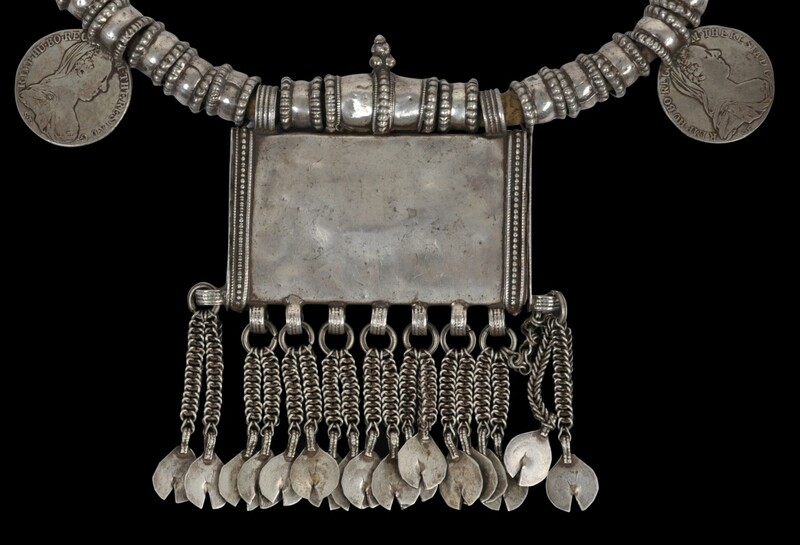 This beautiful necklace and amulet box is from the the Bedouin people of Oman. The box itself, which is known as a hirz, is of silver and decorated with applied gold plaques. This use of gold plaques suggests it might be from Nizwa in Oman. 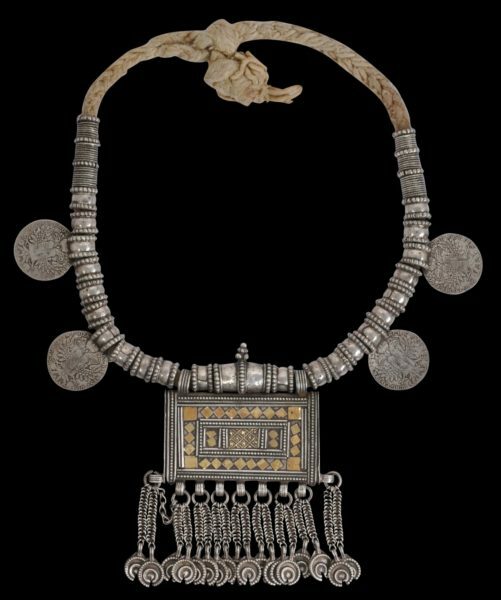 The box has eighteen thick, well-made silver chains suspended from it and each of these terminates with an Islamic-inspired silver crescent plaque. The box opens at one end to allow slips of paper inscribed with protective Koran verses to be slipped inside. The necklace comprises a thick, twisted wool cord clad for the most part with thick silver beads decorated with granulation and other work. Four of these have silver Maria Theresa thaler Coins attached. The coins are genuine examples rather than locally cast copies. Maria Theresa thalers have been struck in Austria since the reign of Empress Maria Theresa of the Austro-Hungarian Empire. The Empress died in 1780 and since that time, all thalers that were subsequently struck were minted with that date regardless of the actual year that they were produced. The coins achieved such a level of trust for their silver content (which is 83.3% silver) in the Middle East that neither the design nor the date was varied, and so for more than 200 years, the coins were used as an international currency among the tribes and the states of the Middle East, in much the same was as the Spanish dollar was used as an international currency at the time elsewhere. 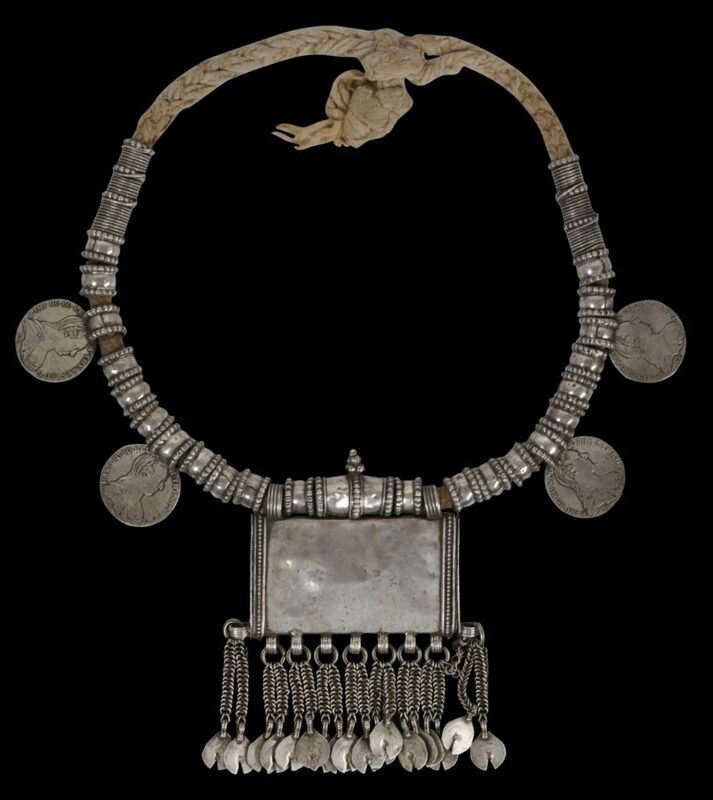 It was felt that the Bedouin tribes who valued the coins would not trust the silver content of coins with any other date. This means that thalers were being minted in Austro-Hungary into the 19th century but still were cast with the 1780 date. The thalers were used to complete most important transactions locally and were also given as dowries. They were an important source of silver and were melted locally for jewellery. The coins made their way to the ports of the Red Sea, Egypt and northern Africa from the ports of Genoa, Trieste, Livorno and Marseille. European traders used the coins to buy precious materials from the Gulf and northern Africa which it desired – commodities such as spices, coffee, gum Arabic, indigo, pearls, and tortoise shell. 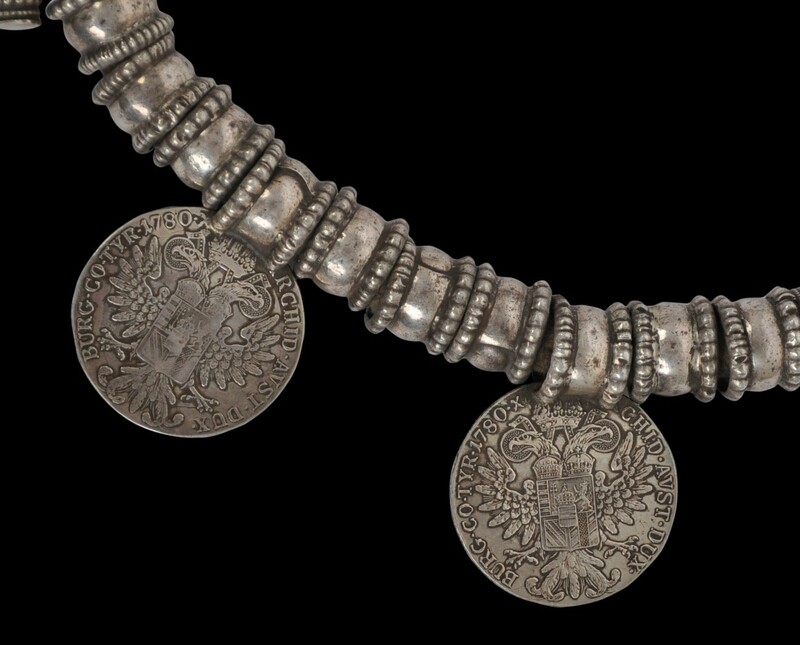 The importance, the perceived value, and the beauty of the coins saw them incorporated into local jewellery, most particularly in Oman and Yemen. Related examples (but without the thaler coins) are illustrated in Geoffroy-Schneiter (2011, p. 36), Hoek (2004, p. 54), Borel (1994, p. 119), Rajab (1998, p. 41) and Hawley (2000, p. 41). The example here is in excellent condition and is stable and wearable. It has a very good patina and clear and obvious age. Al-Jadir, S., Arab & Islamic Silver, Stacey International, 1981. Borel, F., The Splendour of Ethnic Jewelry: From the Colette and Jean-Pierre Ghysels Collection, Thames & Hudson, 1994. Geoffroy-Schneiter, B., Asian Jewellery: Ethnic Rings, Bracelets, Necklaces, Earrings, Belts, Head Ornaments, Skira, 2011. Harrigan, P., ‘Tales of a Thaler’, Saudi Aramco World, January/February 2003. Hawley, R., Omani Silver, Longman, 1978. Hawley, R., Silver: The Traditional Art of Oman, Stacey International, 2000. Hoek, C., et al, Ethnic Jewellery: From Africa, Asia and Pacific Islands, Pepin Press, 2004. 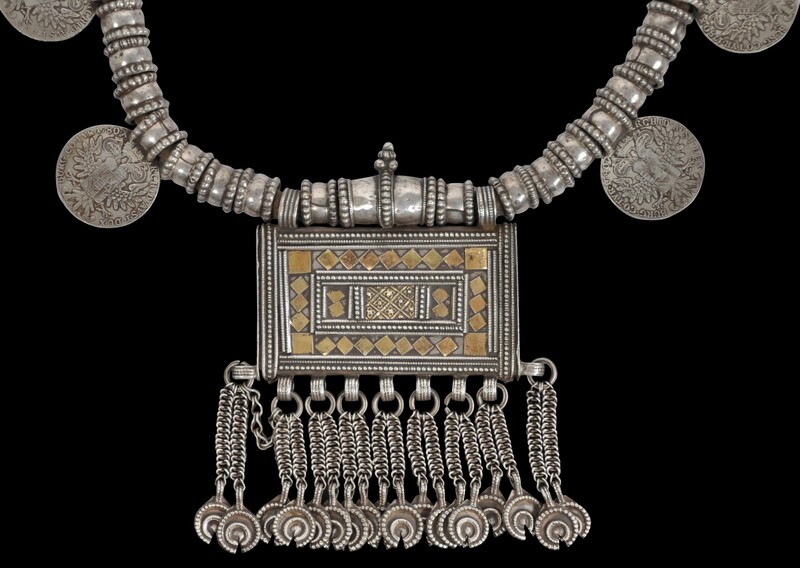 Rajab, J.S., Silver Jewellery of Oman, Tareq Rajab Museum, 1998. Ransom, M., Silver Treasures from the Land of Sheba: Regional Yemeni Jewelry, AUC Press, 2014.